Whilst stripping it down there was slight play in the clutch unit from the needle roller bearing. £39 for a bearing is bad enough, but then I had a good look at the rest of the clutch unit and found quite a bit of wear on the booster unit faces which would explain the metallic like tappet sound that goes when clutch is pulled. I also found the oil jet was pretty gummed up, which I'm guessing hasn't help with the bearing and booster wear. Anyway does anyone have a new booster unit or good condition used one for sale? Not quite as bad as that. I first thought shims need doing but it completely went as soon as clutch it applied. There is about 3mm play in the booster unit and after watching a few vids of new ones, there is very little if any free play. Gonna pop to ktm shop and grab new needle bearing and give that a go Monday with the oil jet now unblocked but I'm pretty sure it's that booster unit. 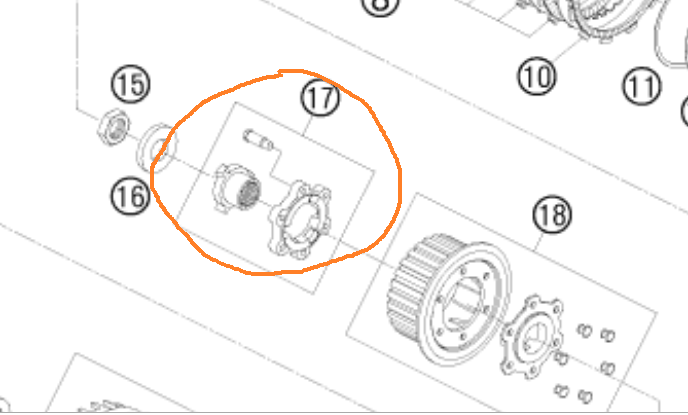 Not sure I understand what you mean by booster unit - I think that I have a circa 2k miles complete OE clutch assembly somewhere - should I dig it out? Aphex wrote: Does it sound like this? sam46 wrote: Not quite as bad as that. While you have it apart check if there is any play in the basket. I've read about the booster going out on the ADV forums but nothing like that here. I can't seem to find that thread where some one was asking what parts we want made for the Dukes but that would be a good one to add to it!